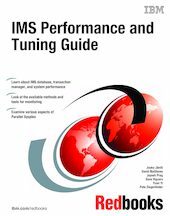 This IBM Redbooks publication provides IMS performance monitoring and tuning information. This book differs from previous IMS performance and tuning IBM Redbooks in that there is less emphasis on the internal workings of IMS and more information about why and how certain options can affect the performance of IMS. Most of the information in the previous book IMS Version 7 Performance Monitoring and Tuning Update, SG24-6404, is still valid, and in most cases, continues to be valid in any future versions of IMS. This book is not an update or rewrite but instead attempts to be more of a guide than a reference. As such, the team gathered experiences and data from actual production environments as well as from IBM benchmarks and solicited input from experts in as many areas as possible. You should be able to find valuable new information and perhaps validate things you might have questioned. Hardware and software characteristics are constantly changing, but hopefully the information that you find here provides a basis to help you react to change and to keep your IMS running efficiently. In this book, we introduce methods and tools for monitoring and tuning IMS systems, and in addition to IMS TM and DB system-wide performance considerations, we dedicate separate chapters for application considerations, IMS and DB2 interoperability, the Parallel Sysplex environment, and On Demand considerations.